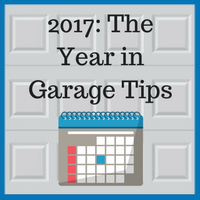 2017 was a great year for garage owners in the Chicago and DuPage County area, and at Blue Sky Builders, we shared a wide variety of tips on how to maintain and clean your garage, keep pests away, make changes or renovations, and much more. As we begin the new year, this is a good chance to look back at some of our best blogs from the past year and use their insights as you prepare your garage for the upcoming seasons. How to Clean Your Garage After it Floods: Inspired by the devastation of Hurricane Harvey, this blog looks at the steps you should take to clean out your garage and the items stored within it if it has been damaged in a flood. Preventing a Turkey Fryer Fire in Your Garage This Thanksgiving: The use of deep fryers to cook Thanksgiving turkeys has become more popular in recent years, but they can present a serious fire hazard. We shared some tips for making sure you stay safe and avoid damaging your garage and your home when cooking your Thanksgiving dinner. How to Clean Up Melted Snow in Your Garage: Snowy and icy winter weather can lead to water damage in your garage. We provided some helpful tips for cleaning up the mess that melted snow can cause and preventing future damage. 5 Ways to Prep your Garage for the Summer: With the dramatic shifts in weather that we experience in the Chicago area, it is always good to make sure your garage is ready for the changing seasons. This blog provides some excellent tips that will help you make sure you are prepared for the warm summer months. Security Tips That Can Keep Your Garage Safe: Home security is important, and when taking steps to secure your home, you should be sure not to neglect your garage. We share some ways you can keep your garage safe from both thieves and animals. How to Prepare Your Garage for An Electric Car: Convenient, economical electric vehicles are becoming more popular and affordable. If you are considering purchasing this type of car, you should make sure you have the equipment that will allow you to park and charge your car in your garage. This is only a small selection of the topics we have covered on our blog over the past year, and we will be continuing to share helpful garage tips, so please stay tuned! At Blue Sky Builders, we have over 38 years of experience creating custom garage solutions, and we are incredibly proud of the work that we do. If you have any questions about renovating or repairing your garage in the new year, please contact us today at 630-852-8485. To view some of our work, please visit our gallery.